There is ample statistical, financial, and anecdotal support for the contention that the Good Food movement is, indeed, a movement — one that is expanding markets for healthier food, produced more sustainably, more humanely, and with greater fairness to small farmers, entrepreneurs, and farm workers. This Good Food sector is engaging the interest and participation of millions of American consumers. Perhaps the clearest sign of the fast-rising influence of the Good Food movement, though, is the greater attention that it is drawing from government officials at the federal level and in many states and communities. Most of those consumers are also voters, of course. And along with all the health, environmental, and social virtues attached to the movement, leaders in the public sector are showing increased recognition that the Good Food sector is also a powerful force for economic growth. It is building stronger and more sustainable local economies, revitalizing urban and rural communities that have endured setbacks, providing small farms and new businesses opportunities to prosper and grow — and creating new jobs. And most of that sector’s potential is as of yet untapped. So it should be taken as a positive sign that the engagement of policy makers stepped up to an unprecedented level at FamilyFarmed‘s annual Good Food Festival & Conference that took place Thursday through Saturday of last week in Chicago. 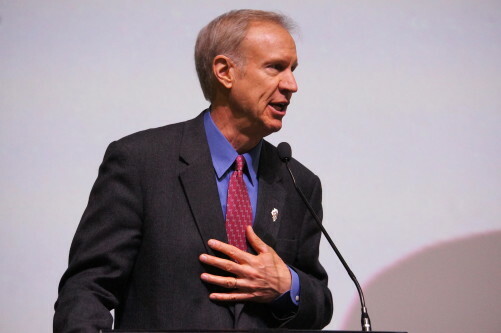 Bruce Rauner, a Republican who in January became the new governor of Illinois, became the first chief executive to attend the Good Food Festival & Conference in its 11-year history. Food system issues rarely came up last year during Rauner’s contest with Democratic incumbent Pat Quinn, which was dominated by macro issues about the state’s economy, finances, and taxes. So Conference attendees had to be pleased with the positive vibe of Rauner’s remarks. “I am very committed to your goals and initiatives. 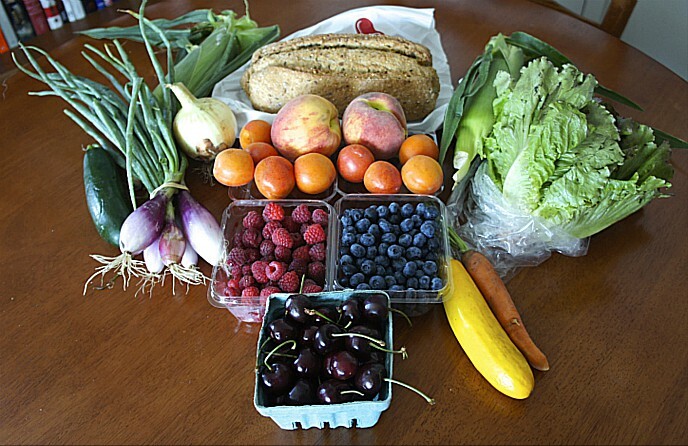 Locally grown, sustainable, responsible, healthy, that’s what food should be all about,” Rauner said on Friday. He added what supporters of the Good Food movement already firmly believe: that it will help the Illinois economy, create jobs, and enable state residents to build healthier, stronger, higher quality lives. 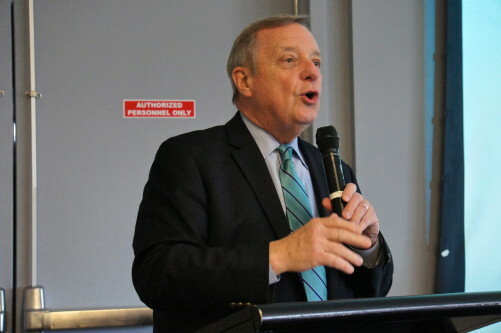 Richard J. Durbin, the state’s senior U.S. senator, also made his first visit to the event. 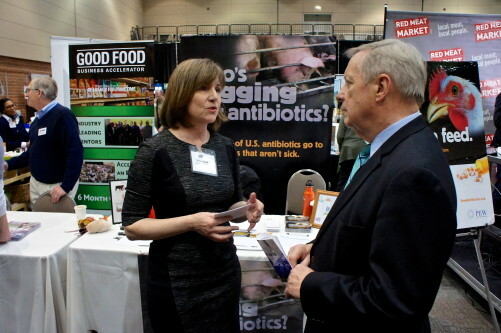 Durbin, who also spoke and visited Friday, pointed to tangible examples of how the Good Food movement is affecting positive change in federal food and farm policy making. 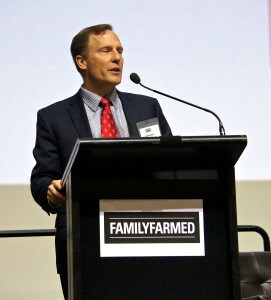 He noted that the five-year farm bill cleared by Congress and signed into law last year by President Barack Obama “will make some important changes to support family farms, community sustainable agriculture, farmers markets , food hubs, and healthy nutrition programs.” These, Durbin said, including increased funding for the federal Farmers Market Promotion Program and the Local Food Promotional Program, administered by the U.S. Department of Agriculture’s Agricultural Marketing Service. Durbin — who was elected to a fourth term last year and, as minority whip, is the second highest-ranking Democrat in the Senate — also referred to historic examples of how leadership mobilized the American people around issues involving food, such as the Victory Gardens promoted by President Woodrow Wilson during World War I and by President Franklin D. Roosevelt during World War II. 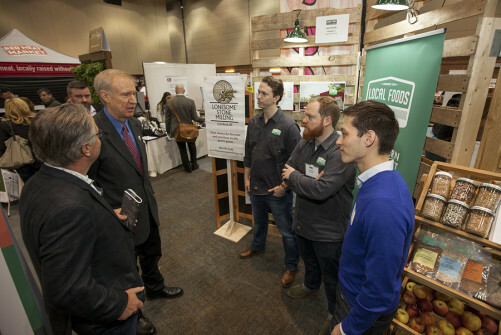 Both Rauner and Durbin capped their visits by touring the Exhibit Hall and chatting with some of the roughly 100 food and farm exhibitors who participated in the oldest and biggest trade show in the United States focused on local and sustainable food. Support for the movement spread across government boundaries. Local government was well-represented at the Good Food Financing & Innovation Conference Thursday by Cook County (Chicago) Board President Toni Preckwinkle and Jeff Malehorn, who heads World Business Chicago, the arm of the city’s government that works to recruit and retain businesses. Both emphasized the important role that Good Food plays in stimulating local economic growth, and mentioned they will be working closely with a Food Cluster organization made up of businesses in the sector to develop strategies to increase opportunities for Good Food businesses. Citing the 2013 “Partnering for Prosperity” report issued by the county, Preckwinkle noted, that “one of the regional sectors that was recommended to focus on was food.” Chicago and its region have a long history as a center for food processing and manufacturing, and Preckwinkle cited statistics for the overall food industry (not just the Good Food sector) in northeastern Illinois — 4,500 firms, 130,000 jobs, and $32.4 billion in annual revenue, much of that concentrated in Cook County — that underscore its important role and potential for growth. 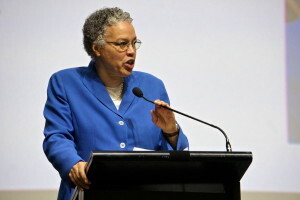 Preckwinkle also highlighted one of the most important benefits of the Good Food business sector: its potential to revitalize neighborhoods and communities that have suffered economic distress. Malehorn, who delivered the city of Chicago’s perspective, began his remarks with a personal aside that, his coat and tie notwithstanding, he grew up on a farm in Lancaster, Pennsylvania. 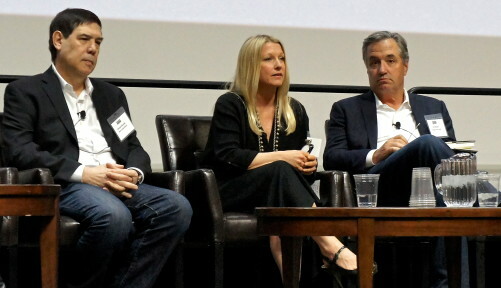 He noted that food is representative of many industries in the city’s economic development plan, “whether it is manufacturing or workforce development, exports, streamlining city processes, neighborhood strategies.” He noted the presence on the Welcome panel of Howard Tullman, CEO of 1871 — the business incubator at Chicago’s historic Merchandise Mart that has emerged as the city’s center for innovation — and said he was excited about all the exciting things about food that are happening there, including FamilyFarmed’s Good Food Business Accelerator. The leaders of two federal agencies that play big roles in providing financing and technical assistance to a variety of Good Food farmers and businesses: Anne Alonzo, the administrator of the U.S. Department of Agriculture’s Agricultural Marketing Service, and Marianne O’Brien Markowitz, administrator for the U.S. Small Business Adminstration‘s Midwest Region. 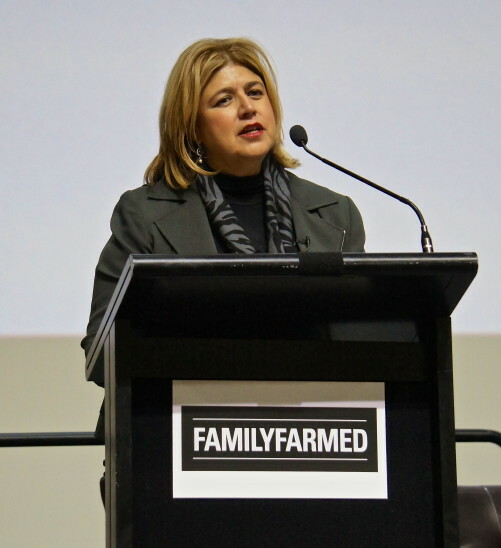 Both the USDA and SBA are major funders of FamilyFarmed’s Good Food Business Accelerator. And one thing was the same as it always was: the participation and strong turnout of activists and experts who work tirelessly to propel the movement forward. 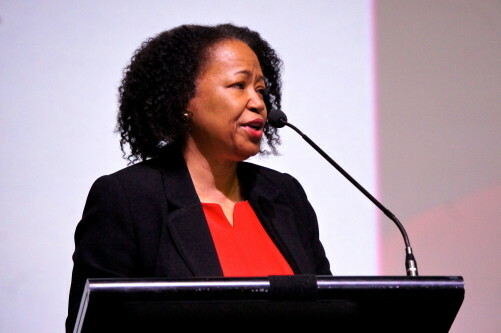 The Opening Symposium of the annual Food Policy summit Friday — the program at which Rauner spoke — included Dr. Gail Christopher of the W.K. Kellogg Foundation, a powerful longtime backer of Good Food in general and of child nutrition initiatives in particular; Ferd Hoefner of the National Sustainable Agriculture Coalition, which has mobilized support for the advances in federal policy to which Durbin referred; Fred Kirschenmann, the president of the Stone Barns Center for Food & Agriculture in New York and an intellectual force in the movement; Erika Allen of Growing Power — the urban agriculture pioneer founded by her father, Will Allen — who is a leader of an effort to persuade the city of Chicago to adopt a Good Food procurement policy; and John-Mark Hack, executive director of the recently formed Local Food Association, which is working to organize its members to have an impact on food policy. The importance of an intensified effort to weigh in on Good Food policy initiatives can hardly be overstated. The continued growth of local farm-to-school programs that are providing healthier food options to schoolchildren, and the goal of extending them to children of pre-school age, will be at stake in legislation to reauthorize the federal child nutrition act that expires Sept. 30. 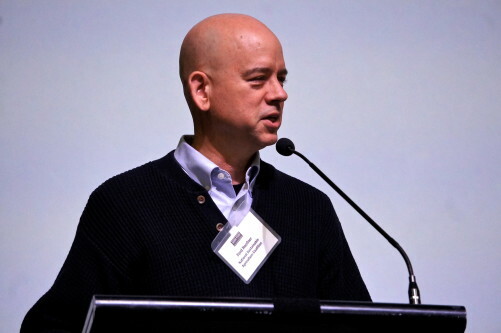 And while the Good Food community was pleased that there was some progress in its direction in the five-year farm bill enacted last year, it is imperative to have documentable numbers on the size and scope of this market if the movement is to maximize its impact on the next farm bill. It is often said that consumers are increasingly voting with their dollars in favor of a better food system, and the market is responding — a little slower than some of us would wish, perhaps, but surely. But to make these changes happen faster, consumers also need to let policy makers now that they want more Good Food, and they vote with their votes too. 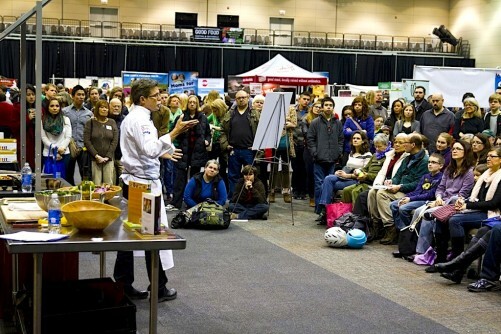 The fact that more politicians and officials are showing up in public forums such as the Good Food Festival & Conference is a good sign that they are aware that this is a movement that is just beginning to know its own strength. And it is up to everyone who wants a healthier, more sustainable, more humane, and fairer food system to remind them of that. Photographs by Bob Benenson except where noted. This entry was posted in Child nutrition and health, Farm Bill, Financing, Food and health, Food Entrepreneurs, Food policy, Good Food business development, Good Food Festivals, Good Food Financing Fair, Good Food movement, Good Food Policymaking, Sustainable conferences and tagged Anne Alonzo, Cook County Board President Toni Preckwinkle, FamilyFarmed, Farm bill, Food Policy, Good Food Festival & Conference, Good Food policy, Good Food policy making, Growing Power, Illinois Gov. Bruce Rauner, Illinois U.S. Senator Richard J. Durbin, Jeff Malehorn, Local Food Association, Marianne Markowitz, National Sustainable Agriculture Coalition, Stone Barns Center for Food & Agriculture, U.S. Small Business Administration, USDA Agricultural Marketing Service, W.K. Kellogg Foundation, World Business Chicago. Bookmark the permalink.